How to calculate APGAR score? 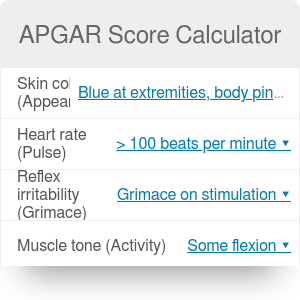 With the APGAR score calculator, you will be able to summarize the condition of an infant soon after birth or assess its response to resuscitation. To achieve this, we will use the world-renowned APGAR scale. The baby can score between 0 and 10 points and the more points it gets, the better its well-being is. In the further text you will learn the definition of APGAR score, what does APGAR stand for (as an acronym) and how to calculate APGAR score. Do you have your own child? Are you by any chance a pediatrician? We have other pediatric calculators for you! Check our pediatric GFR and pediatric blood volume calculators. APGAR score was invented in 1952 by Dr. Virginia Apgar, an anesthesiologist at NewYork–Presbyterian Hospital, as a tool to rapidly assess the health status of newborn children. There are five components of APGAR scale: color, heart rate, reflexes, muscle tone, and respiration. In each of these categories, a child can score 0, 1 or 2 points, which means that altogether the result of APGAR score can be between 0 and 10 points. A score of 7-10 points is defined as reassuring, 4-6 points as moderately abnormal and 0-3 as low. All infants should be reported with APGAR score at the time of 1 and 5 minutes after the birth. Additionally, children with a score below 7 should undergo an additional assessment at 10, 15 and 20 minutes postpartum. The score of 5 or less at 5 minutes is an indication to obtain umbilical artery blood for an arterial blood gas test in acidosis diagnostic. APGAR scale can be used as well as a method to monitor effects of resuscitation performed on an infant: a higher score at 5 minutes after birth than at 1 minute postpartum may indicate a positive response to resuscitation. Does your child patient require a blood transfusion? How much blood do you need to prepare? Please, help yourself with our pediatric blood transfusion volume calculator! APGAR is a backronym, which means that it was constructed from a set of words whose initial letters spell an actual word – the surname of Dr. Virginia Apgar. It was created to make the components of APGAR scale easier to memorize and remind in a situation of need. There is yet another mnemonic technique to remember APGAR scale – "How Ready Is This Child?" where H reminds Heart rate, R – Respiratory effort, I – Irritability, T – Tone and C – Color. Which one is more suitable for you? Color of the skin - choose between: all pale or blue (0 pts), blue extremities with pink body (1 pt), all pink (2 pts). Heart rate – auscultate the beating of the child's heart and select according to your examination: no beating (0 pts), under 100 beats per minute (1 pt), over 100 beats per minute (2 pts). Reflex irritability – stimulate the child with an intranasal suction catheter or by irritating the bottom of feet, then assess: no response to stimulation (0 pts), grimace on stimulation (1 pt), cry on stimulation (2 pts). Muscle tone – look for flexion and active motion and choose: no activity and limp muscles (0 pts), there is some flexion (1 pt), there is flexion of both arms and legs, the child is moving actively (2 pts). Respiration – observe the breathing of the child and pick one of three: no respiration (0 pts), weak respiration or cry with irregular breaths and gasping (1 pt), strong cry with good respiration (2 pts). You can also use our calculator which will guide you through the process of assessing and then will sum up the points for you! APGAR score can be affected by the week of pregnancy in which baby is born, medications administered to mother, neurologic, cardiologic, respiratory conditions, resuscitation and subjective assessment of some of its components by medical professionals. It has to be kept in mind that asphyxia – too low supply of oxygen to the body of an infant, cannot be diagnosed only with APGAR scale. Furthermore, APGAR score should not be used in the prediction of individual mortality and neurologic outcomes. You can find more information and recommendations considering APGAR score in a document by The American Academy of Pediatrics and the American College of Obstetricians and Gynecologists. APGAR Score Calculator can be embedded on your website to enrich the content you wrote and make it easier for your visitors to understand your message.